Servicengine Director of Project Management Kathy Wallace & Vice President of Client Success Sara Miller accept the Best Vendor Partnership Award. On Thursday May 24, 2018, the Forum for Expatriate Management (FEM) presented Servicengine Corporation with the Best Vendor Partnership – Other Award for our work with the United States Department of Defense National Relocation Program(DNRP). Servicengine partnered with DNRP to implement a streamlined, employee-driven technology using the principle of employee empowerment. The inventive, secure solution allows DoD employees to initiate, manage, and monitor their relocation request for a Permanent Change of Station through a self-managed portal. According to DNRP, the new software transformed a manual and redundant process into an automated end-to-end solution with transparency and security. Read the full Servicengine press release here. 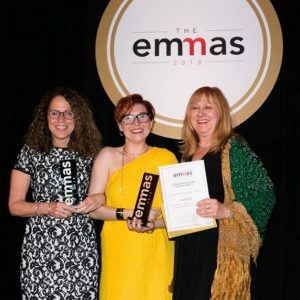 Find the full list of 2018 EMMA Award Winners here.